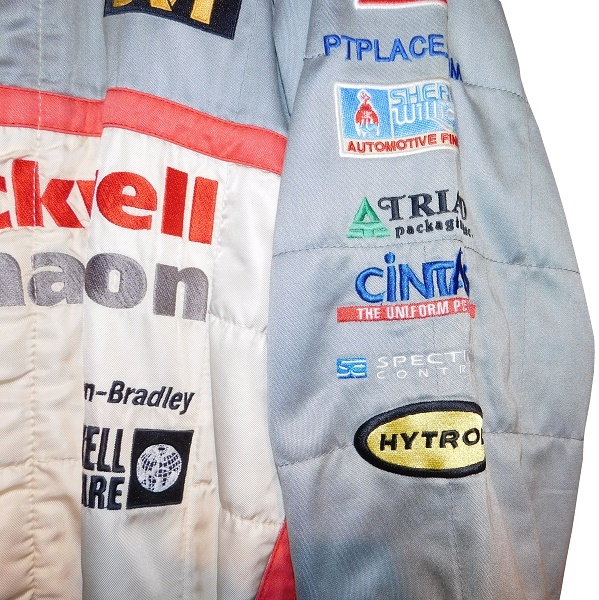 A Firesuit Worn By A Racing Executive…Huh? Founded in 1991, Joe Gibbs Racing has gone from a single car team to a super team powerhouse. The team has shown strength in the Cup Series, the Xfinity Series, and the Truck Series. A lot of top shelf drivers have raced for Joe Gibbs Racing. From 2003 to 2006 the #20 was sponsored by Milwaukee, Wisconsin-based Rockwell Automation. 2002 Truck Series Champion Mike Bliss raced the #20 in 2004, winning the Lowe’s Presents the SpongeBob SquarePants Movie 300, earned 6 top 5’s, and 14 top 10’s. 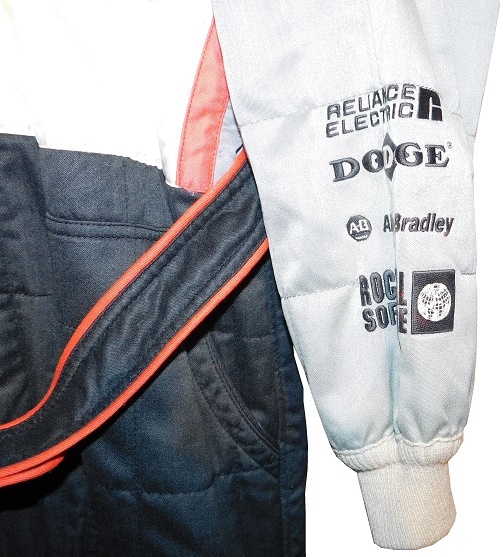 During that time, a crew member wore this suit, which was later give to Steve DeSouza, who serves as Vice President of Xfinity Series Operations at Joe Gibbs Racing, which shows light wear. 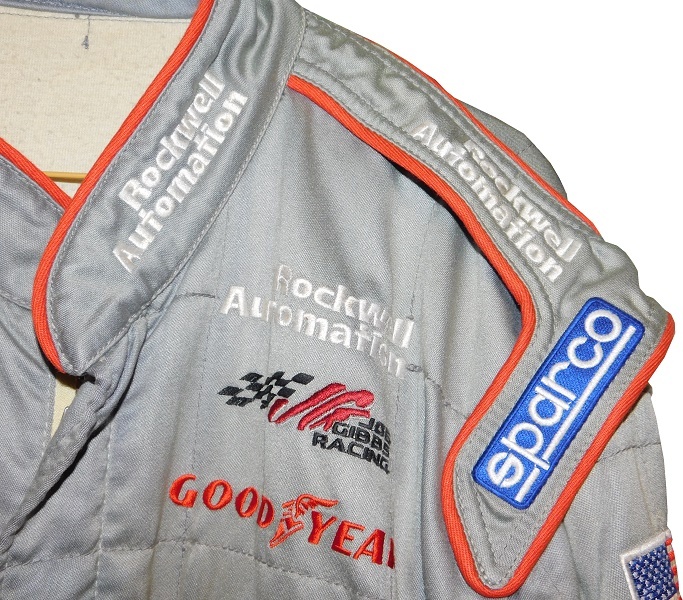 The collar is a standard collar, with ROCKWELL AUTOMATION logos embroidered into it. The right chest features ROCKWELL AUTOMATION, NASCAR BUSCH SERIES GRAND NATIONAL DIVISION logos, and a Chevy bow tie logo embroidered. 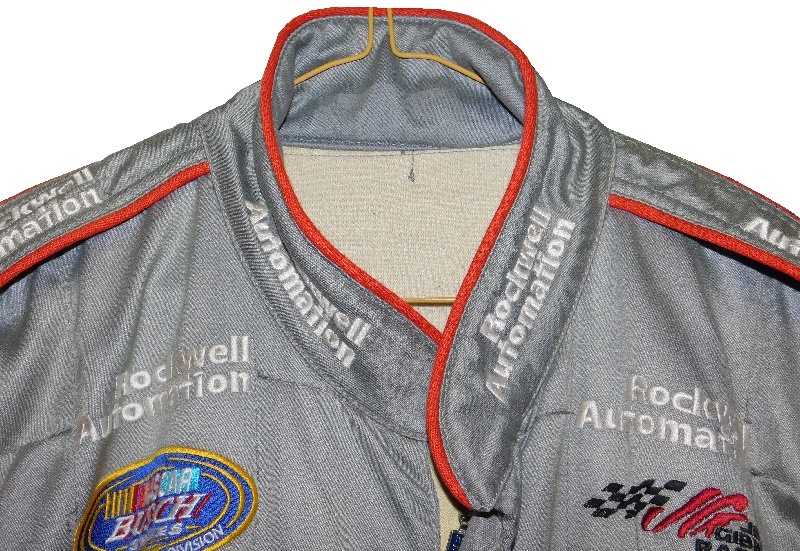 The left chest features ROCKWELL AUTOMATION, JOE GIBBS RACING, GOODYEAR, and DVT MACHINE VISION logos embroidered into it. 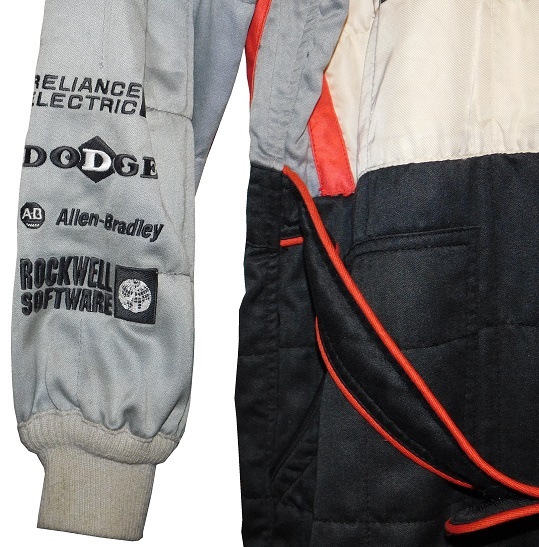 The front torso features a ROCKWELL AUTOMATION logo and some of their product logos, including DODGE BEARINGS, RELIANCE ELECTRIC DRIVES, ALLEN-BRADLEY, and ROCKWELL SOFTWARE logos embroidered on a white background. 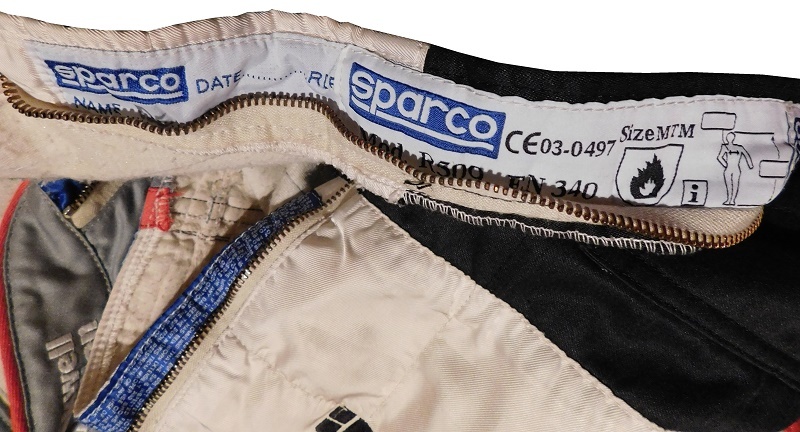 Inside the zipper on the front is the Sparco Warranty label, and the care tag. 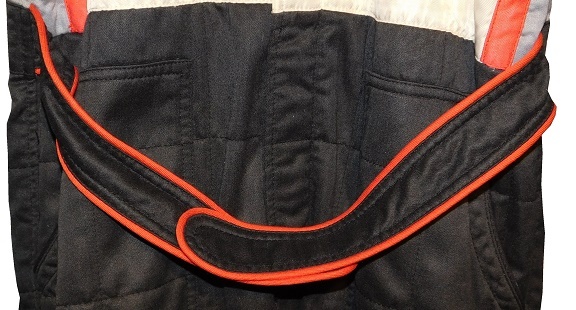 There is a red outlined black belt over the black legs, and is unadorned. The black legs have red and white ROCKWELL AUTOMATION logos in television position. The suit has boot cuffs. 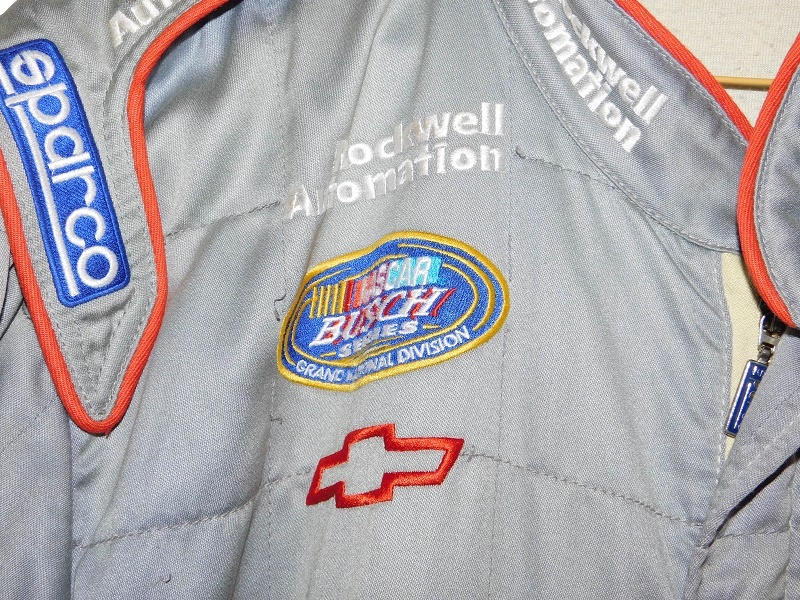 The silver-gray shoulders have ROCKWELL AUTOMATION and SPARCO logos on the epaulets. 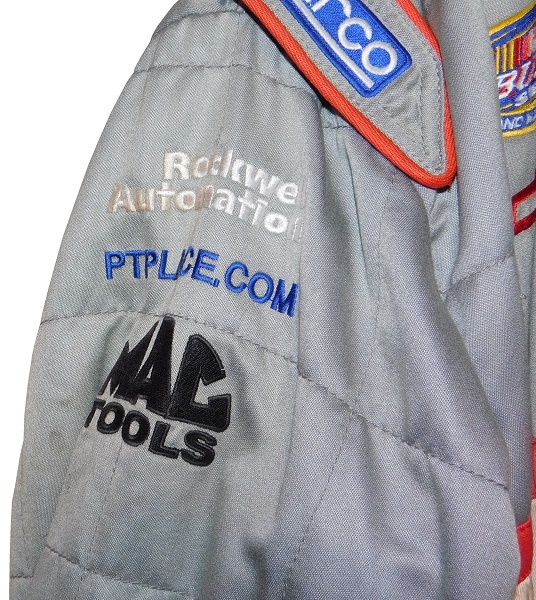 The right sleeve has ROCKWELL AUTOMATION, PTPLACE.COM, MAC TOOLS, DODGE BEARINGS, RELIANCE ELECTRIC DRIVES, ALLEN-BRADLEY, and ROCKWELL SOFTWARE logos embroidered.The back of the suit features some very light wear. The left sleeve featres an American Flag patch, SHERWIN-WILLIAMS, TRIAD PACKAGING, CINTAS, SPECTRUM CONTROLS, and HYTROL logos embroidered. 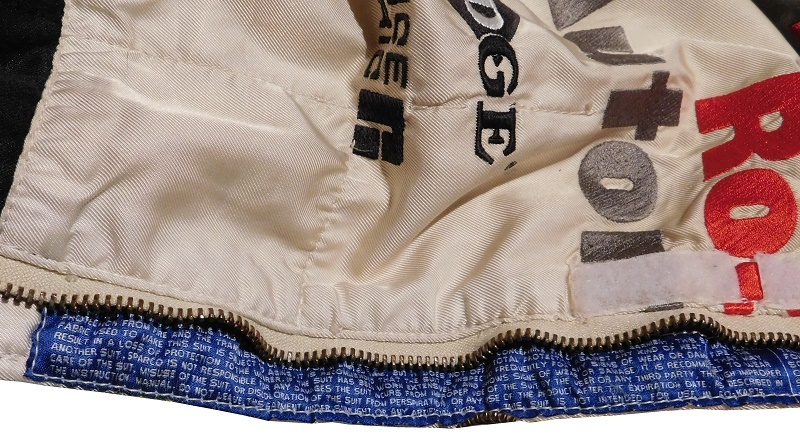 The back of the suit features some very light wear. 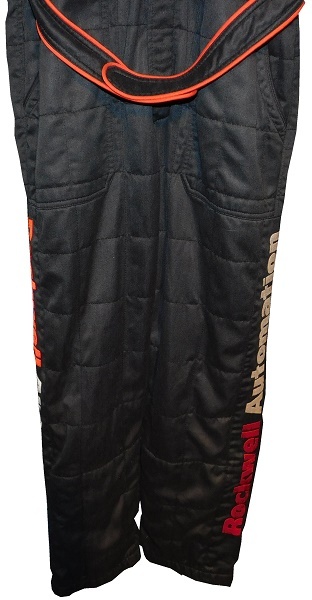 The back of the neck features an FIA STANDARD 8856-2000 RS.012.01 logo, which indicates that the suit was made in 2004. 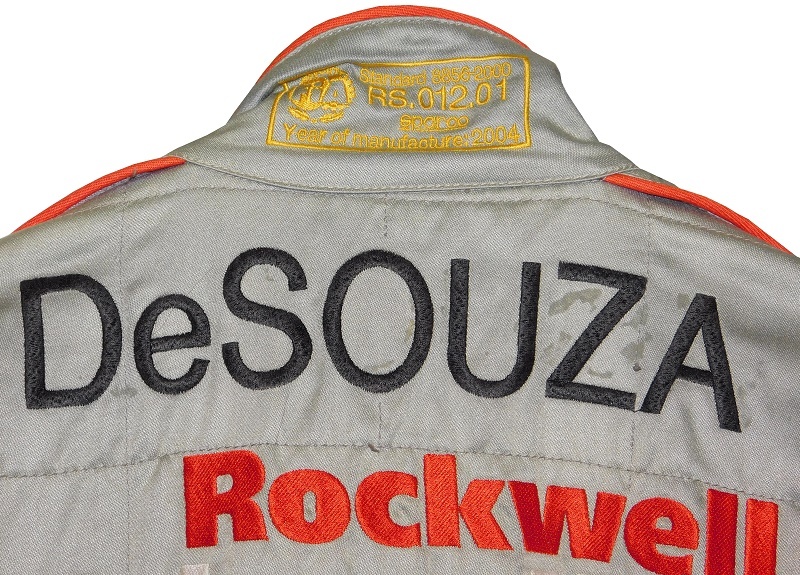 Below that is the name DeSOUZA, which is embroidered into the suit. The area that the name is embroidered shows evidence of a nameplate having been removed. 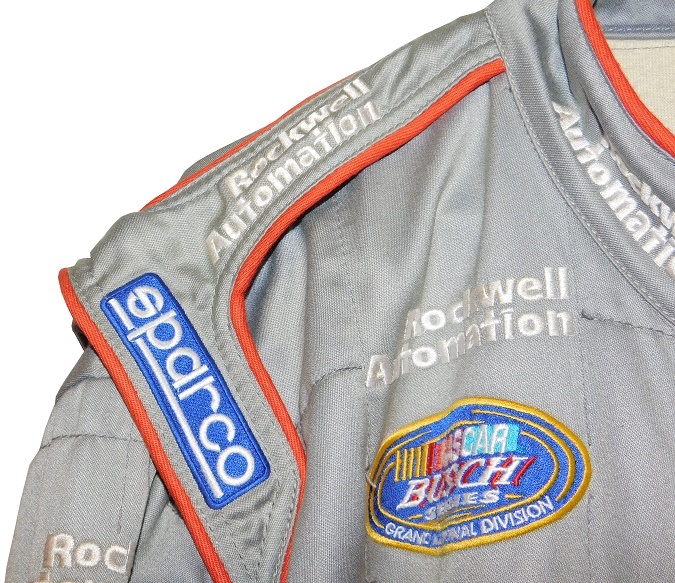 The back torso features a ROCKWELL AUTOMATION RACING logo, as well as ROCKWELLAUTOMATION.COM embroidered into it. The suit was worn by Steve DeSouza, who currently serves as Vice President of Nationwide Series Operations at Joe Gibbs Racing, Inc.. DeSouza is a former F1 Powerboat world champion who made the jump to NASCAR in the 1990’s. He has served as VP for Xfinity Series Opperations for many years for Joe Gibbs Racing. There is no evidence that DeSouza was an active member of the pit crew. It may have been a gift, or DeSouza was a backup crew member. 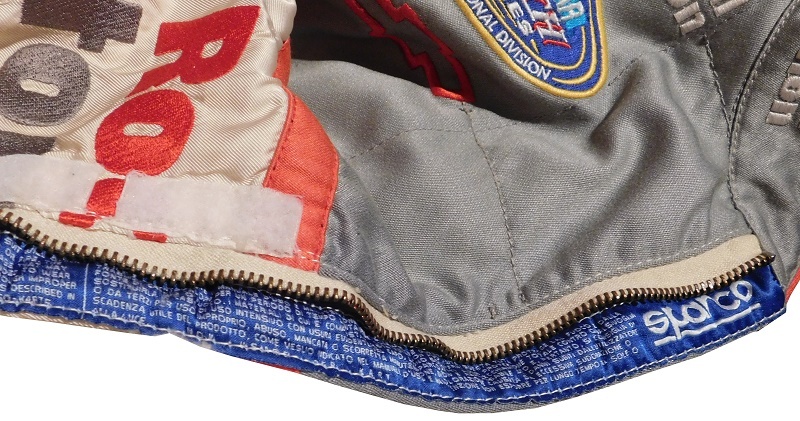 The area around the name shows evidence of a nameplate being removed, which isn’t that shocking, since these suits cost close to $2000, and teams often recycle suits when crew members leave the team. The fact that the suit doesn’t show as much wear as other suits could also mean that the suit was made for DeSouza specifically. Many crew chiefs wear firesuits, due to the danger posed by fire, so it makes sense that DeSouza would want to wear a firesuit. I don’t know everything about this suit, but I do know one thing…it is a nice looking suit. Next week, a pit crew suit that has been through the ringer.